In 1970, PTR Baler & Compactor Company built our first baler. From that day, we’ve become the supplier of choice for 16 of the 20 top retailers in the country. 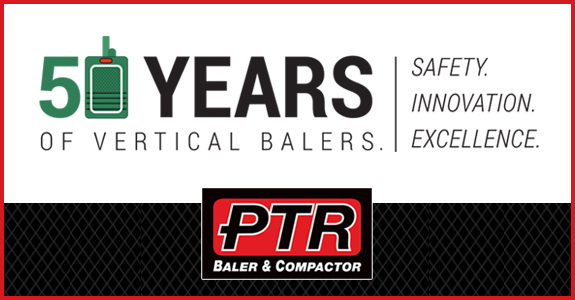 In just the last 30 years, PTR has produced and sold upwards of 60,000 balers & compactors across the United States. Our Vertical Hydraulic Balers are the answer to keeping critical floorspace clear of dry waste such as cardboard, as well as the ability to implement recycling and sustainability policies. The benefits of our products aren’t limited to any one kind of organization. Markets including Retail non-food, Retail food, Warehouse, Distribution, Industrial, Medical, Universities, Public Institutions and Facility management will all benefit from the increased efficiency, safety and productivity of PTR Vertical Balers and compactors. Now, in 2018, we celebrate 50 years of leading the industry in safety, innovation and excellence. We offer a line of over 25 baler models and nearly 20 different stationary compactors. All of our equipment is manufactured with quality, safety, longevity and low total cost of ownership in mind. It won’t take long before you notice the cost savings on tipping and compliance fees, fuel and more. We’ve always strived to lead the way through technology and innovation. The difference between the quality of our product over the competition can be greatly attributed to the expertise of the welders responsible for creating them. PTR welders are all highly trained professionals and fully AWS certified. This is not the norm across the industry, but it always will be at PTR. Since the first baler was built, PTR has been responsible for many innovations that have shaped the entire industry. • In the 1980’s, PTR manufactured the first high density baler in the industry, capable of producing 1,000 lbs. bales. It was a huge milestone for the company and the industry, as well. • In 2003, we implemented a Programmable Logic Controller (PLC). By 2012, PTR’s PLC’s were a standard feature in all 10HP balers. • In 2013, PTR beame the first manufacturer ever to have 3 Third Party Certifications- C-ETL, C-UL and PSR. • 2016 was the year PTR was the first to produce the 1 ton bale. It was also the year PTR created the first baler installed with load cells that could communicate remotely. We often ask our customers what they want, and what they think will improve their operations. Then we work to deliver the perfect solution. At PTR we know if one organization has a need, many others have that need, too. We’re not showing signs of slowing down, either. PTR will continue to innovate, like with the creation of the new Quiet Power Unit. It’s our ’50th Anniversary Option’ to our Vertical Balers, and it’s the difference between being the noisiest equipment in the shop, to just about the same as a quiet conversation. Learn more by contacting us today. Another major innovation is the Compactor Weight Scale. This weight monitoring system allows you to optimize pickups for required weights. Why does this matter to you? Because you will be able to truly zero in on accuracy, save considerably on tipping fees, eliminate overweight containers and increase safety. The system is available for both balers and compactors. Contact PTR to find out the cost-savings this equipment can mean for you. Don’t miss our next newsletter with updates and information that will make a difference in your business. Click the ‘Join My List’ tab on the side of our Facebook page to sign up!